PIZZA TEEN! : Speak To A Recruiter! Win An iPod! This should probably fall under my "Absurd Juxtaposition" headline. 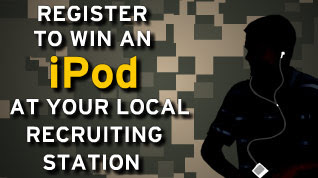 As part of its effort to curb a decline in enlistments, the Army is now offering potential recruits the CHANCE to win an iPod by speaking with a recruiting officer. I believe Nathan Hale was initially drawn to the Revolutionary War by a comparable offer. The ability to recharge your battery and keep on rockin' your Fall Out Boy/Shakira hotmix while in the field might prove unpredictable, however, because the last I heard, militias had taken control of Baghdad's electric grid. Click on the image above to learn more about this once-in-a-lifetime offer. And while I'm on the subject, anyone else notice how the iPod has become the proverbial carrot at the end of the stick for damn near EVERYTHING?! Test-drive a car and win an iPod! Order new carpeting and win an iPod! Convert a non-believer to Catholicism and win an iPod! Buy an iPod and win...ANOTHER iPod!